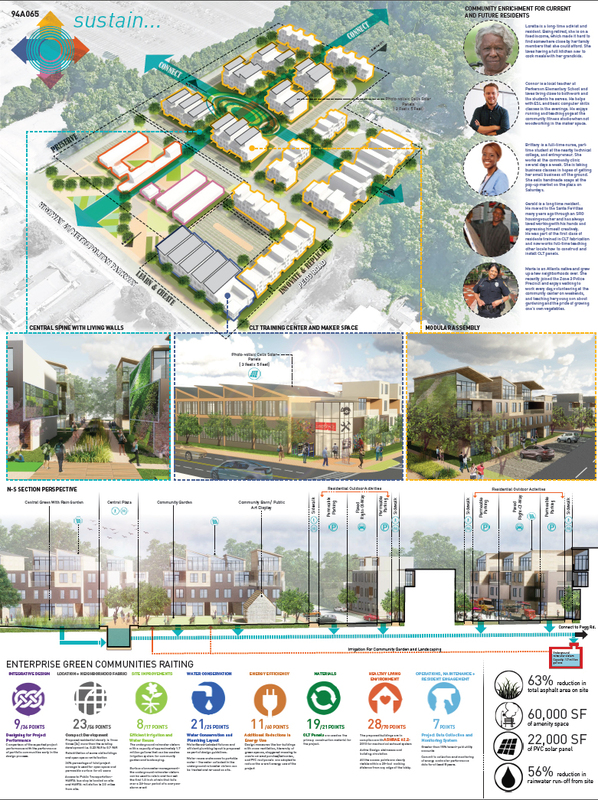 Over the course of several weeks at the end of 2017, a multidisciplinary design team from Lord Aeck Sargent’s Atlanta office, with help from local experts in market analysis and affordable housing development, submitted for the City of Atlanta’s first ever affordable housing design competition: domestiCITY. Sponsored by the City of Atlanta Department of City Planning, Enterprise Community Partners and Assist Community Design Center, the domestiCITY competition is structured as “a two-phase design competition that will explore best practices and innovative strategies for the planning, design, construction and operation of affordable and sustainable developments in increasingly urbanized areas.” The competition site consists of 7.1 acres of mostly developed land: Santa Fe Villas with fully-occupied supportive housing and the abandoned Town & Country Courts. Phase I of the competition saw a flurry of interest with 189 registrants across 15 countries represented. Ultimately, 20 proposals were submitted and considered by the December 2017 deadline. In early January 2018, an independent jury panel of design leaders, affordable housing experts and community representatives selected six teams to receive a $20,000 cash prize. Two of these teams would receive an additional $30,000 and the opportunity to further develop their program, design and financial plan in Phase II. Proposals were judged across four primary categories: architectural innovation, architectural programming, economic feasibility and project replicability. Among the other teams recognized for their submissions are: Sadyr Khabukhayev (Kazakhstan) “Architectural Innovation” Award, David Baker Architects (San Francisco), Siyi He & Yixin Ren (Rhode Island School of Design) and MPN Partners (London/Vietnam). Through multiple design charrettes, pin-ups and iterations informed by market realities, the LAS team put together a proposal for a unique housing solution that would be both innovative, in terms of architectural and green infrastructure strategies, and replicable, because of its modular approach and financial feasibility. This solution was largely driven by the use of Cross-Laminated Timber (CLT): an innovative, engineered timber product that has schedule time and cost savings, low embedded energy (renewable material) and the opportunity to create local jobs for Georgia’s strong lumber industry. The use of CLT as our primary construction technology helps to reduce the overall project budget, allowing us to create greater affordability for the supportive and workforce housing and job creation opportunities in our proposal. To respect and acknowledge the history of the site through the adaptive use of several historic structures as part of the site’s redevelopment. Our Phase I competition boards were submitted along with a 20-page narrative book. Click the image below to access boards. Phase II of domestiCITY will entail a more detailed pro forma, further design development and proposed methodology for community outreach and engagement among other requirements. Phase II will conclude in March 2018 followed by a public exhibition to showcase all the recognized design submissions. For more information on the competition or the submissions, visit the competition site. Click here City of Atlanta’s official press release.